AUD/USD: Short positions are relevant. The US dollar is falling after stock indexes. 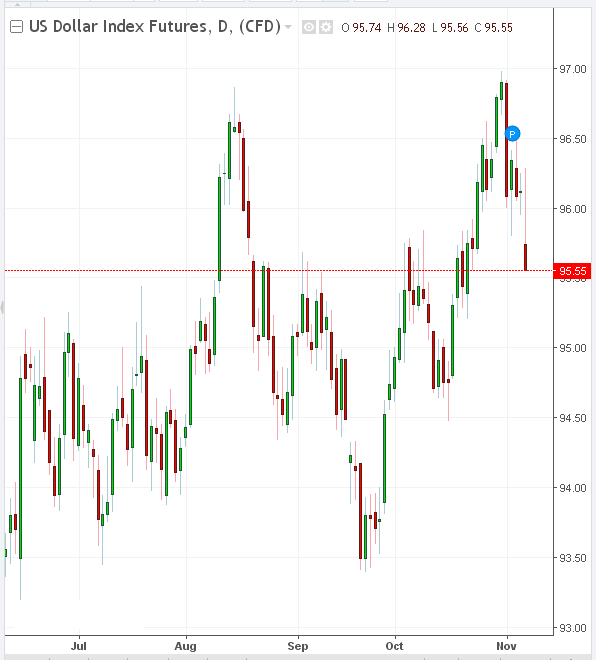 The DXY dollar index, which tracks the US currency against a basket of 6 other major currencies, has been dropping on Thursday for the third day in a row. DXY futures traded at the beginning of the American session near the 94.74 mark, 40 points lower than the opening price of the trading day. Nevertheless, the dollar, in general, maintains its position and upward trend against the background of good economic data and high levels of business and consumer confidence. His current decline should be considered so far as corrective. The dollar also receives support from a $ 1.5 trillion tax cut in December. Investors expect growth this year to be a sustainable fiscal stimulus. Markets expect the Fed to raise interest rates again this year, as well as three times next year. Amid further increases in interest rates, the investment attractiveness of the dollar will grow. However, on Thursday, the US dollar fell, including against the Australian dollar. "The Fed is making a mistake", Trump told reporters after the worst fall in stock markets in more than seven months. "I think the Fed has lost its head", he added. Trump made this statement amid falling American stock market. According to Trump, the fall in the stock market is "a correction that we have been waiting for a long time. Nevertheless, I really disagree with the actions of the Fed", he said. At the same time, the Australian dollar remains under pressure. According to Lucy Ellis, senior economist at the Reserve Bank of Australia, monetary policy should remain soft to reduce unused production capacity. "Removing reserve capacity may take some time. In this regard, for several years, a stimulating monetary policy may be needed," Ellis added. RBA has kept its key interest rate at a record low of 1.5% for more than two years. Some economists expect the Central Bank to keep rates at such levels until 2020. Thus, the different orientation of the monetary policies of the Fed and the RBA remains the main fundamental factor in favor of further reducing the pair AUD / USD. In the long run, the pair is likely to decline. The most pessimistic forecasts suggest a fall to the support level of 0.6300 (2009 lows). Despite the upward correction, negative dynamics persist and prevail. Breakdown of the local support level of 0.7045 will resume the decline of AUD / USD with targets at the support levels of 0.6910 (lows of September 2015), 0.6830 (2016 lows). 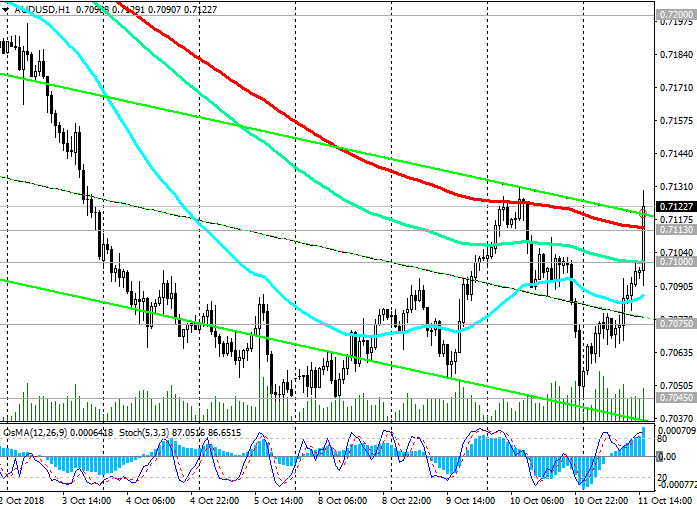 AUD / USD is in a global downtrend that began in August 2011. Short positions are preferred. 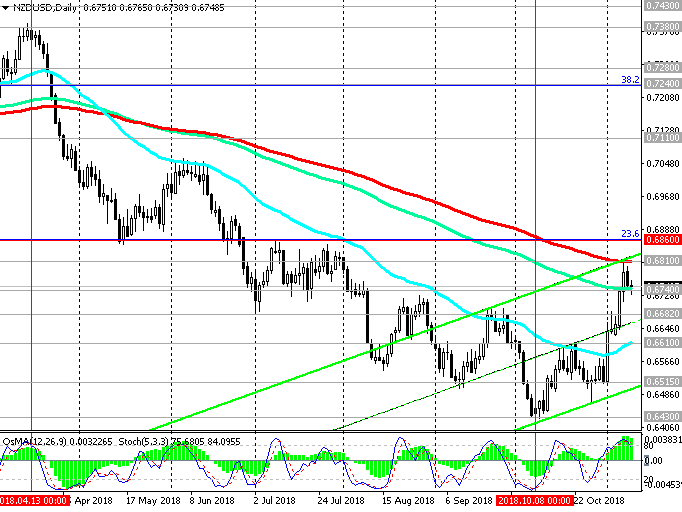 Only if AUD / USD returns to the zone above the key resistance level of 0.7450 (ЕМА200 on the daily chart) can we consider long-term long positions with targets at 0.7820 (ЕМА200 on the weekly chart and Fibonacci level 23.6% of the correction to the decline wave of the pair since August 2011 years and the level of 1.1030. The minimum of this wave is near the level of 0.6830). The signal for the development of this scenario will be the breakdown of the short-term resistance level of 0.7113 (ЕМА200 on the 1-hour chart). At the end of last week, oil prices fell amid a collapse in the stock market, and also as a result of the revision of forecasts by OPEC and the International Energy Agency for Demand this year and next, downward. At the beginning of the European trading session, WTI crude oil traded near the mark of 71.80 dollars per barrel. Positive dynamics of oil prices persists, despite the decline last week. 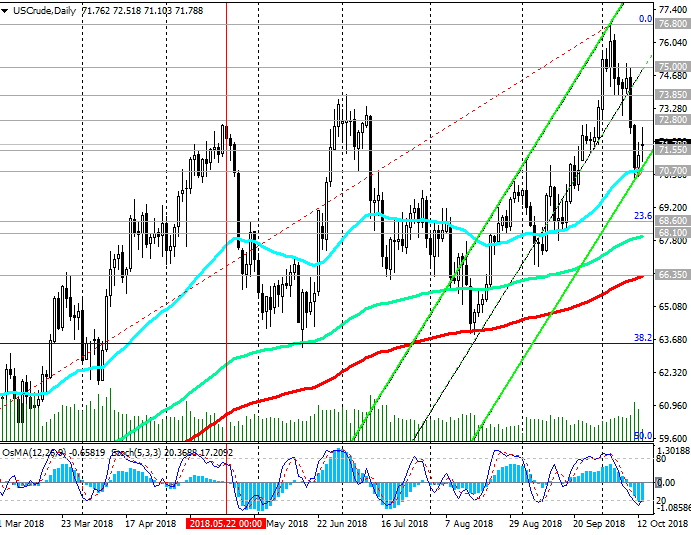 The price of WTI crude oil is in an uptrend, maintaining a long-term positive trend and trading in the ascending channels on the daily and weekly charts. 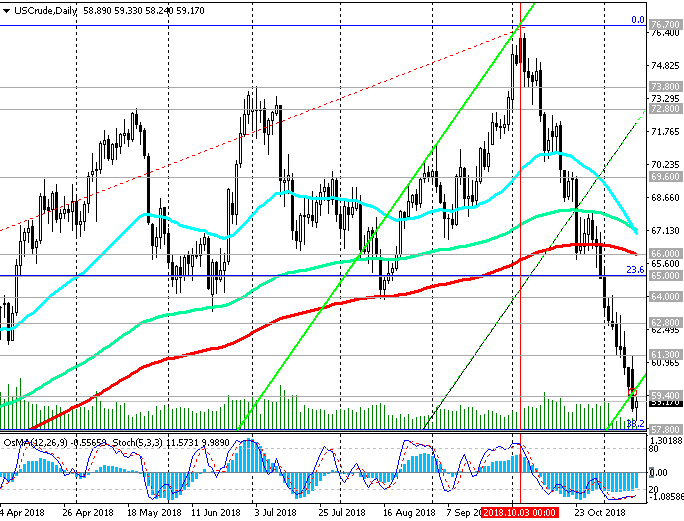 On Thursday, the price of oil found support at 70.70 (EMA50 on the daily chart). Having repulsed from this level, the price attempts to grow above the important support level of 71.55 (ЕМА200 on the 4-hour chart). The overall trend is still bullish. Immediate growth targets are located at resistance levels of 72.80 (May highs), 73.85 (July highs), 75.00, 76.80 (annual and multi-year highs). In the case of the breakdown of the support level of 70.70, the targets will be the support levels of 68.60 (Fibonacci level 23.6% of the correction to the growth wave that started in June 2017 with the support level near the 42.00 mark), 68.10 (ЕМА144 on the daily chart), 66.35 (ЕМА200 on the daily). chart). While the price is above the key support level of 66.35, a long-term upward trend remains. 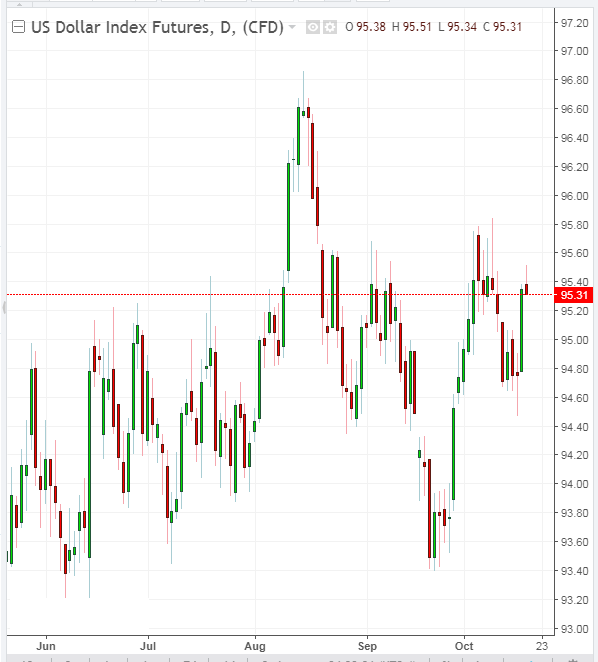 Against the background of the continuing instability of stock markets, as well as weaker than expected macro data coming from the US, and the weakening dollar, investors are buying gold again. Last Monday, gold prices peaked from the end of July. Gold futures on COMEX rose on Monday to $ 1233.00 per ounce. A weaker dollar makes gold more attractive to holders of other currencies. 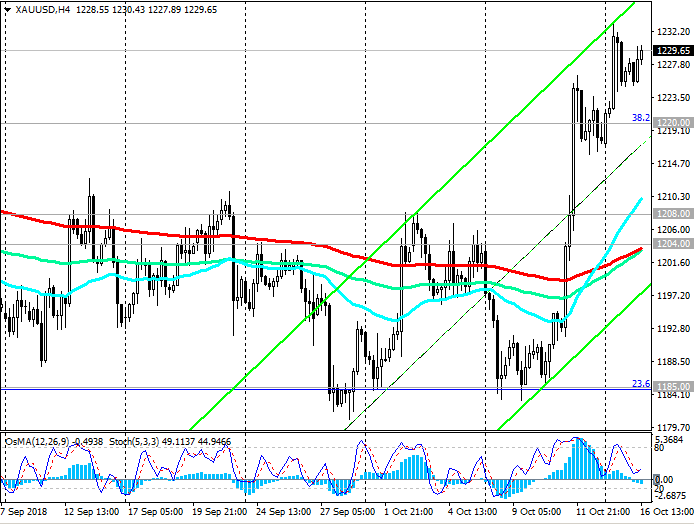 However, the current growth in gold prices should be considered as a correction after a long period of decline. American stock indices in general are holding near record levels this year, and a strong dollar and high yield of treasury bonds have a negative impact on gold. After new strong financial reports and economic data, stock indexes and the dollar will start to grow again, and this will limit the potential for gold price growth. Despite the recent increase in gold quotes, it is necessary to look for an opportunity to enter short positions in the XAU / USD pair. The general trend of XAU / USD is still bearish. In the face of rising interest rates, the investment attractiveness of the dollar is rising, and of gold - is falling. 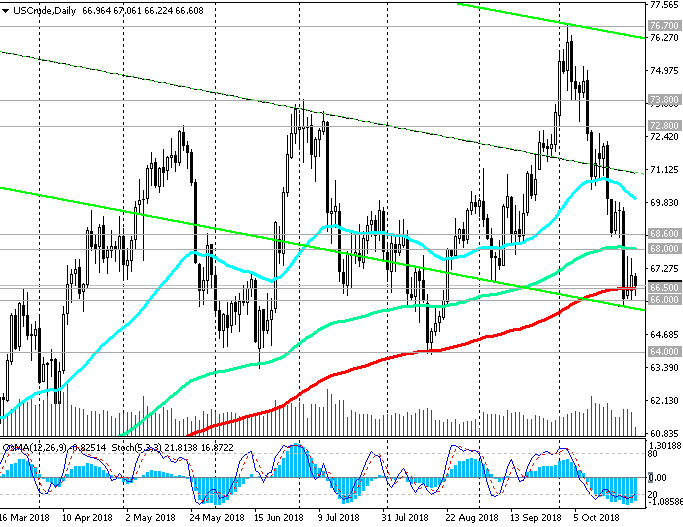 From mid-April, XAU / USD has been trading in a downward channel on a weekly chart, the lower limit of which is near the support level of 1050.00 (2015 lows). Below the key resistance level of 1248.00 (EMA200 on the daily chart and the Fibonacci level of 50% of the correction to the wave of decline since July 2016), the downward trend prevails. The breakdown of the support level of 1220.00 (Fibonacci level 38.2%) confirms the return of XAU / USD to the global downtrend, which began in October 2012, and into the downward channel on the daily chart. Correctional growth may still continue to resistance levels of 1239.00 (EMA144 on the daily chart), 1248.00. However, in the long run, short positions are preferred below these levels. The US dollar strengthened significantly on Wednesday against the background of uncertainties on Brexit, and after the publication of the minutes from the September Fed meeting. According to protocols published on Wednesday, the US central bank is going to continue to raise interest rates until the economy slows down. Despite the fact that “two participants (FOMC) noted that they will not support the introduction of a restraining policy in the absence of obvious signs of overheating of the economy and inflation”, in general, the Fed leaders are inclined to believe that the rates are low enough to stimulate lending, investment and expenses that support economic growth. In the minutes of the September meeting, published Wednesday, the Fed signaled the possibility of another rate increase in 2018 and three increases in 2019. According to the leaders of the Fed, raising rates will prevent overheating of the economy and keep inflation at a target level of 2%. Higher interest rates usually increase the demand for national currency. Investors also prefer the dollar during the period of trade instability, as this currency gets support due to faster economic growth than in other countries. US economic growth is now higher than a couple of years ago. At the same time, representatives of the UK and the EU, according to press reports, find it difficult to come to a consensus to make progress in the Brexit talks, and this raises doubts that the parties will be able to reach an agreement at all. The EU is ready to extend by one year the transition period for the UK to break the deadlock. The achievement of a trade agreement remains questionable, and the parties argue that they are stepping up preparations for the case of a British exit from the EU without an agreement. Against this background, the pound remains under pressure. A spokesman for the Bank of England, Canliff, said on Wednesday that “the British pound may experience a "strong fall" in the event of a "bad Brexit". As a result, the growth of the US dollar on Wednesday was the strongest in the last two weeks. The DXY dollar index, which tracks the US currency against a basket of 6 other major currencies, rose 57 points to 95.35 on Wednesday. The yield on 10-year US Treasury bonds on Thursday is kept in the area of ​​maximum marks (3.203%) after last week it reached 3.261%, the highest mark in 7.5 years. It also helps to strengthen the dollar. 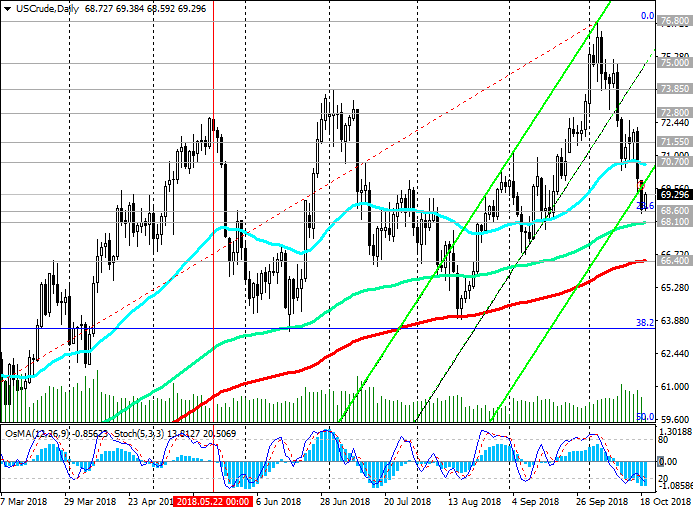 On Friday, the price of WTI crude oil reached an important support level of 68.60 (Fibonacci level 23.6% of the correction to the growth wave that started in June 2017 from the level of support near the 42.00 mark), after which an upward correction began. Just below is another strong support level of 68.10 (EMA144 on the daily chart). As long as the price is above the key support level of 66.40 (ЕМА200 on the daily chart and the bottom line of the ascending channel on the weekly chart), the long-term uptrend remains. If the price returns to the zone above the resistance level of 70.70, long positions will again become relevant. The overall trend is still bullish. The growth targets in the event of a resumption of positive dynamics are located at the resistance levels of 73.85 (July highs), 75.00, 76.80 (annual and multi-year highs). We are awaiting publication (at 17:00 GMT) of the weekly report of the American oilfield service company Baker Hughes on the number of active oil drilling rigs in the USA. If the report indicates a further increase in the number of drilling rigs (at the moment their number is 869 units), this will have an additional negative impact on oil quotations. Now the attention of market participants will be focused on the speech of the ECB President Mario Draghi, which will begin at 12:30 (GMT). If Mario Draghi makes unexpected statements, then volatility will increase dramatically. It is famous for its ability to expand its financial markets with its comments. If Mario Draghi announces the possibility of extending the QE program after December, the euro could be under additional pressure and decline. 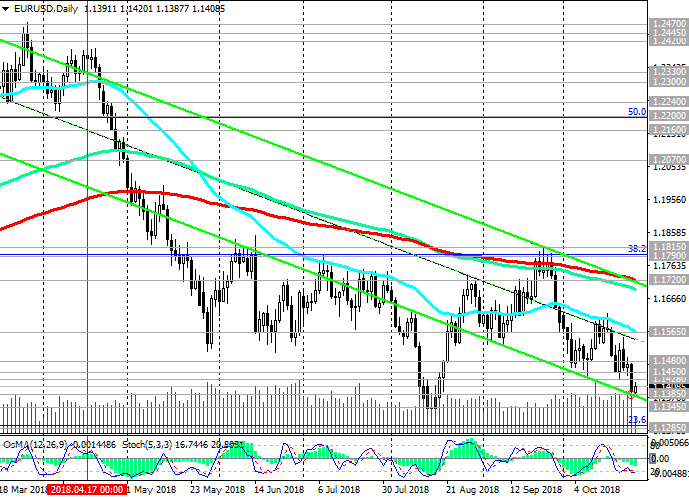 Meanwhile, EUR / USD remains under pressure, trading below the key resistance level of 1.1720 (EMA200, as well as the upper limit of the downward channels on the daily and weekly charts). The triggering of stop-losses at resistance levels 1.1450 (ЕМА200 on the 30-minute chart) and 1.1480 (ЕМА200 on the 1-hour chart) may accelerate the corrective growth of EUR / USD, up to the resistance level of 1.1565. However, negative dynamics prevail against the background of important fundamental factors. Recommended short positions. 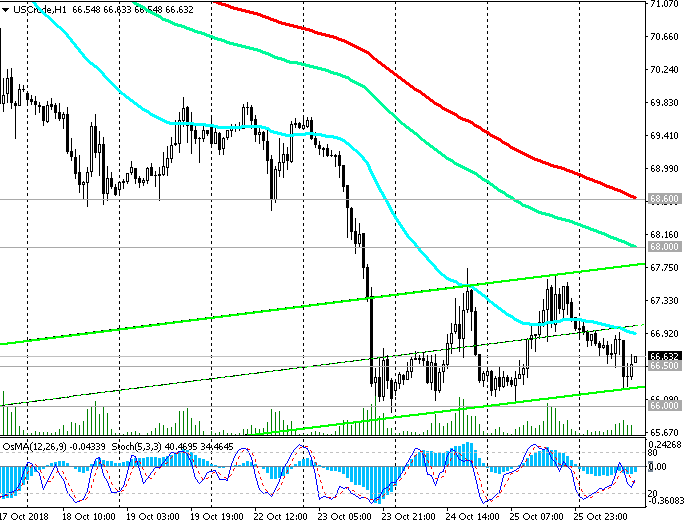 WTI: prices have reached important levels of support. As the Energy Information Administration of the US Department of Energy reported on Wednesday, oil reserves in the country rose again (+6.35 million barrels against the forecast of 3.69 million barrels and after growing by 6.49 million barrels two weeks earlier). Oil prices predictably fell in response to this publication. Investors in the oil market are closely monitoring the situation in the stock markets after large-scale sales occurring this month. The S&P500 index, for example, has lost 9.5% since the beginning of the month; the Nasdaq Composite has rolled back more than 10% from its recent maximum, and the DJIA - by 7.2%. 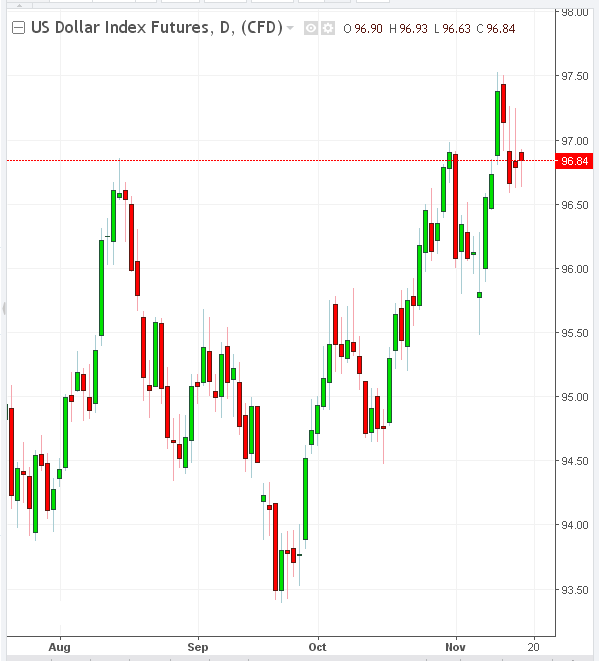 Oil prices are falling against the backdrop of prospects for increasing supply, due to concerns about global economic growth, as well as the strengthening of the dollar. Saudi Arabian Energy Minister Khaled Al-Falih said Monday that his country could increase oil production to 11 million barrels per day against the current average production level of 10.7 million barrels per day. So far, there has been a negative trend in oil prices. However, a political factor may appear in the dynamics of oil prices. If the United States and other Western countries impose sanctions on Saudi Arabia in connection with the murder of journalist Jamal Hashoggi, the Saudis, in response, can respond with an oil embargo that would lead to a price spike. On Friday, oil market participants will follow the publication (at 17:00 GMT) of the weekly report of the American oilfield service company Baker Hughes on the number of active oil drilling rigs in the United States. At the moment, their number is 873 units against 869 units and 861 units two and three weeks earlier. If the report indicates a further increase in the number of drilling rigs, this will have an additional negative impact on oil quotes. As long as oil prices remain high, American oil companies have a significant prospect and incentive to increase production, which, in turn, is another deterrent to oil price growth. On the whole, the long-term positive dynamics of oil prices persists, despite a three-week decline. Prices have reached important support levels, from which a rebound is most likely. Since November 1, sanctions against Iran by the United States come into force, which increases the likelihood of price growth due to the expected drop in Iranian exports by 2 million barrels per day. High likelihood of disruptions in oil supplies from Venezuela and Libya can also support prices. 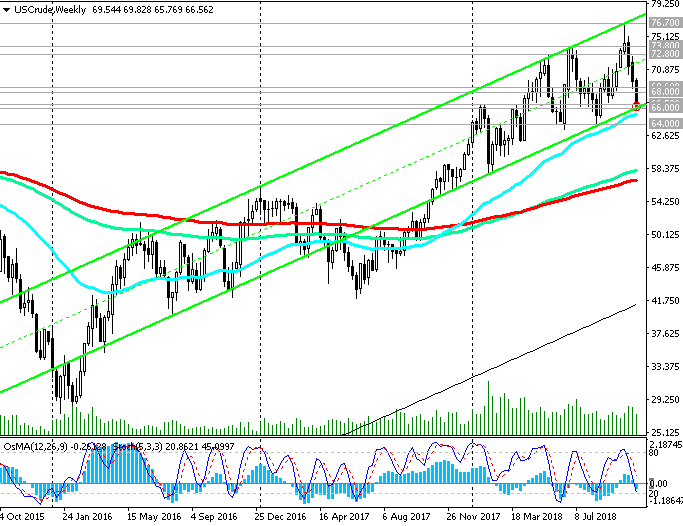 As a result of a three-week decline, the price of WTI crude oil reached an important support level of 66.50 (ЕМА200 on the daily chart and the lower line of the rising channel on the weekly chart). Above this level there is a long-term upward trend. The signal for the resumption of long positions will be the return of prices to the zone above the resistance levels of 68.00 (ЕМА144 on the daily chart), 68.60 (ЕМА200 on the 1-hour chart). The overall trend is still bullish. Growth targets in the event of a resumption of positive dynamics are located at resistance levels of 72.80 (May highs), 73.80 (July highs), 76.70 (annual and multi-year highs). Investors continue to analyze the budget submitted on Monday. Finance Minister Philip Hammond announced the completion of the savings regime, signaling an increase in government spending in the coming years. He expects that by the end of the fiscal year ending in March 2024, the budget deficit will be reduced to 19.8 billion pounds. This view is partly based on higher forecasts for economic growth and tax revenues over the next two years. Nevertheless, the ongoing negotiations on Brexit create a high level of uncertainty about the prospects for the economy. Brexit hard probability, i.e. UK exit from the EU without any agreement, puts pressure on the pound and the British stock market. The budget presented on Monday depends on reaching a favorable Brexit agreement. And until the agreement on Brexit has been reached, the realization of the largest spending in eight years remains in question. In the case of a hard Brexit, a deeper drop in pounds is likely. On Thursday, a meeting of the Bank of England will be held, and at 12:00 (GMT) the decision on rates will be published. It is expected that the rate will remain at the current level of 0.75%. A speech by Bank of England CEO Mark Carney, scheduled for 12:30 (GMT), could stir up markets if he makes unexpected statements. The soft rhetoric of Carney will further lower the pound and the pair GBP / USD. 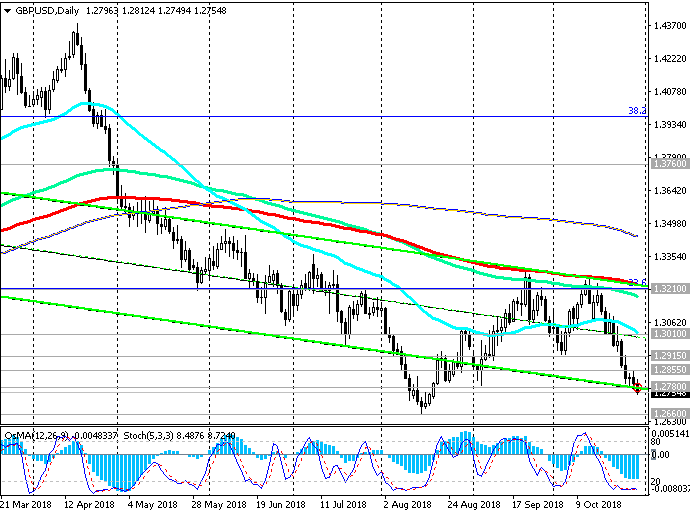 Long-term negative dynamics prevails below the key resistance level of 1.3210 (ЕМА200 on the daily chart and the Fibonacci level of 23.6% of the correction to the decline of GBP / USD in the wave that started in July 2014 near the level of 1.7200). 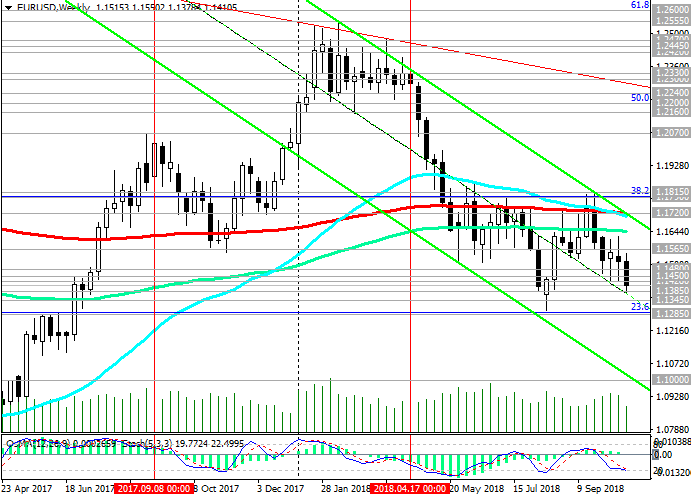 In the case of a confirmed breakdown of the support level of 1.2780 (bottom line of the downward channel on the daily chart) GBP / USD will go inside the downward channel on the weekly chart, the lower limit of which near the 1.2000 mark (2017 lows) is passing. The immediate goal of reducing GBP / USD is at the support level of 1.2660 (2018 lows). The signal for the start of corrective growth will be the breakdown of the short-term resistance level of 1.2915 (ЕМА200 on the 1-hour chart). The maximum correctional growth is possible not above the resistance level of 1.3010 (ЕМА200 on the 4-hour chart, ЕМА50 on the daily chart). On Wednesday, global stock indices are rising for the second day in a row, although October will be completed with significant losses. In October, the DJIA lost 6%, S&amp;P500 - 8%, and the Nasdaq - 11%. European and Asian indices in October suffered the strongest losses, however, most of all investors are worried about the American markets, where active sales were also observed. Market participants focused on concerns about trade conflicts between the United States and China and the Fed's harsh rhetoric about further raising interest rates. Investors are waiting for ADP data on jobs in the US private sector. The forecast is expected to increase by 189,000 employees, against +230,000 in September. On Friday, official data from the Ministry of Labor on Employment for October will be published. In general, strong data are expected to help investors see the strength of the American economy and the stability of the labor market. This, in turn, will give a positive impetus to US stock indexes, as well as positively affect the dollar quotes. If the data on the labor market is confirmed or will be better than the forecast, the dollar will continue to strengthen, which could adversely affect the gold quotes. Gold and dollar tend to move in opposite directions. In the face of an increase in interest rates, as a rule, the investment attractiveness of the dollar increases, and gold - falls. Recently, gold prices have risen due to the influence of a number of fundamental factors. The overall trend of gold, as before, remains bearish, despite the fact that since the beginning of the month the XAU / USD pair has risen by almost 4% to the mark of 1240.00 dollars per ounce. At the beginning of the US trading session, the XAU / USD pair is trading near the mark of 1217.00. Corrective XAU / USD growth, provoked at the beginning of the month by falling stock markets, seems to have ended. Having tested a strong resistance level of 1238.00 (ЕМА144 on the daily chart), above which the key resistance level of 1248.00 is located (ЕМА200 on the daily chart and the Fibonacci level 50% of the correction to the decline wave since July 2016), XAU / USD has been decreasing for the third day in a row. Breakdown of support levels of 1220.00 (Fibonacci 38.2%), 1215.00 (EMA200 on the 4-hour chart, EMA50 on the daily chart) will return XAU / USD to the global downward trend that began in October 2012. 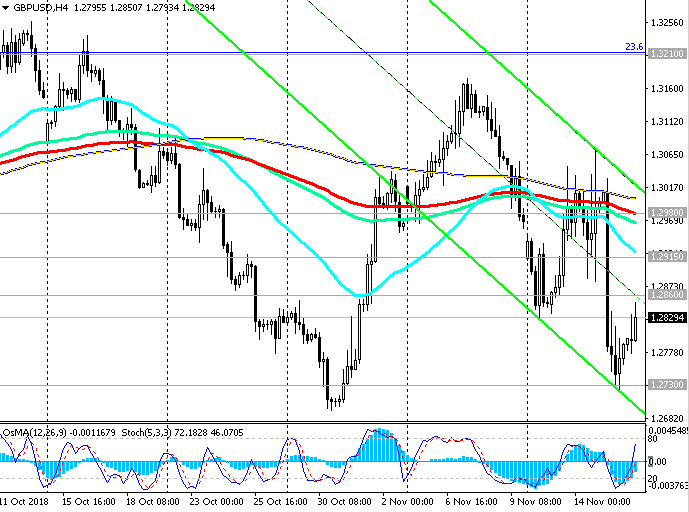 Breaking the resistance level of 1248.00 would increase the risk of breaking the bearish trend. Nevertheless, long-term downward dynamics prevails. In the long run below the level of 1215.00 preferred short positions. 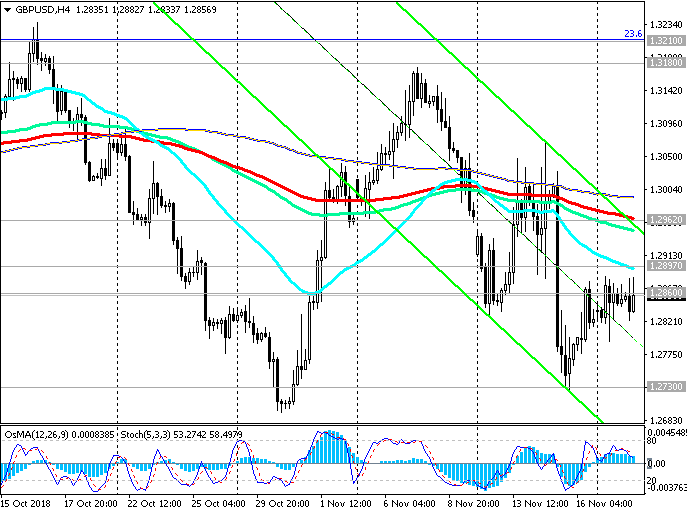 After the publication of data from the New Zealand labor market on Wednesday, investors will follow the RBNZ meeting. At 20:00 (GMT) the decision of the RBNZ on the interest rate will be published. As expected, the interest rate will remain at the same level of 1.75%. With the escalation of the trade conflict between the United States and China, the largest trade and economic partners of New Zealand, the RBNZ is unlikely to decide to change its monetary policy, according to economists, until mid-2019. If the accompanying comments of the RBNZ or at the press conference, which also starts at 20:00 (GMT), contain signals on the possibility of tightening monetary policy in the near future, the New Zealand dollar may strengthen, including against the US dollar, even on the Fed’s plans to tighten US monetary policy. 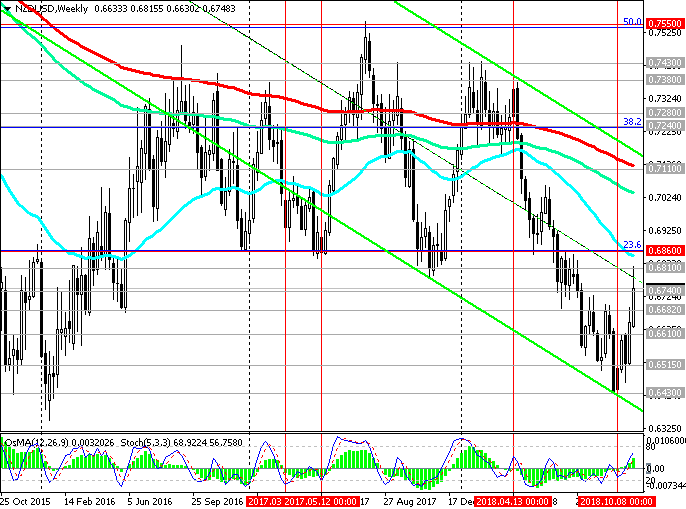 While NZD / USD is trading below the key resistance level of 0.6810 (ЕМА200 on the daily chart), the long-term negative trend continues, despite the current upward correction. 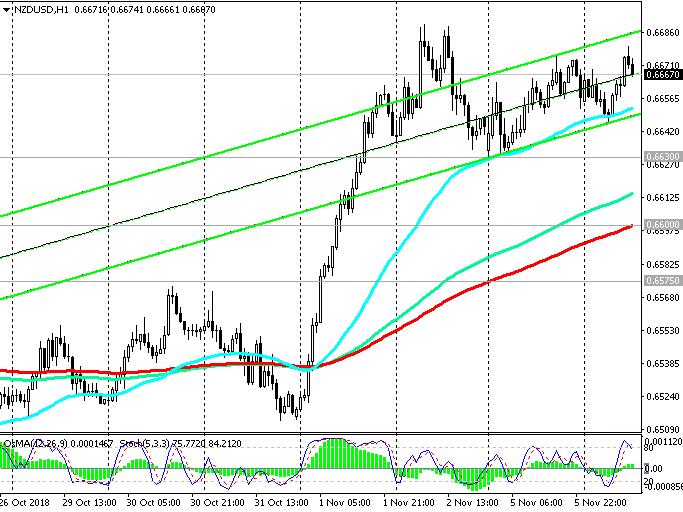 The signal for the resumption of short positions will be a breakdown of the local support level of 0.6630. 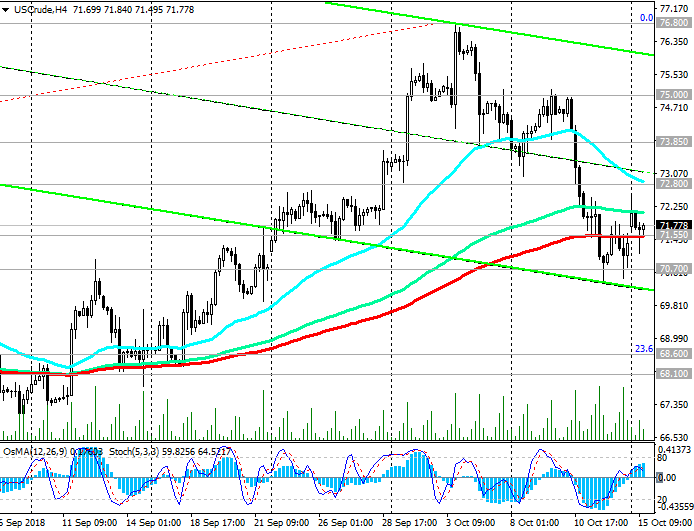 After the breakdown of the short-term support level of 0.6600 (EMA200 on the 1-hour chart), the decline will accelerate. Last edited by TifiaFX; 11-06-2018, 11:10 AM. After the results of voting in the primary elections to the US Congress became known, the dollar fell in the foreign exchange market. The DXY dollar index, which tracks the US currency against a basket of 6 other major currencies, is close to 95.55 at the beginning of the European session on Wednesday, 57 points (0.6%) lower than the closing price on Tuesday. 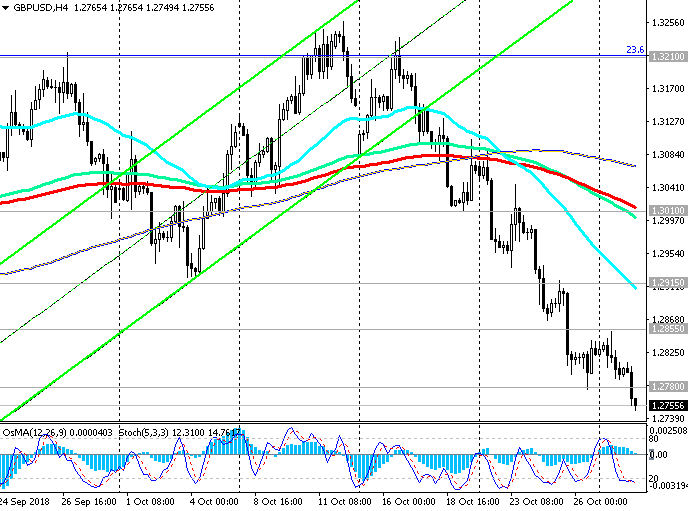 The pair USD / CAD fell on Wednesday by the beginning of the American session by 0.35% to 1.3080. As it became known, the Democratic Party on Tuesday gained control of the House of Representatives. Republicans retained a majority in the Senate and the White House. According to economists, Trump will find it harder to reconcile protectionist measures, which increases the likelihood of rising inflation and a more significant increase in the Fed's key interest rate. Against this background, most likely, the dollar will soon restore lost positions and resume growth. On Wednesday, market participants will pay attention to the publication at 12:30 (GMT) of the Ivey business activity index (PMI), which assesses the business climate in Canada. The index is an important indicator of market conditions and the economy as a whole. The Bureau of Statistics of Canada presented last Friday the data according to which Canada’s foreign trade deficit in September amounted to 416 million Canadian dollars (economists expected a surplus of 200 million Canadian dollars). This is the 21st month in a row, when Canada’s monthly trade balance with the rest of the countries remains in the deficit area. At the same time, the trade deficit with other countries is observed against the background of a simultaneous reduction in Canadian exports and imports. Bank of Canada Governor Stephen Poloz announced at the end of September that interest rates are expected to gradually increase. In October, the Bank of Canada raised its interest rate by 0.25% to 1.75%. After weak macro statistics, presented on Friday, some economists concluded that a further increase in interest rates by the Bank of Canada remains in question. At the same time, the US economy will continue to grow, and the Fed is likely to keep its course and raise the key interest rate again in 2018 and three times in 2019. And this is a strong fundamental factor in favor of further strengthening the US dollar, including in the USD / CAD pair. 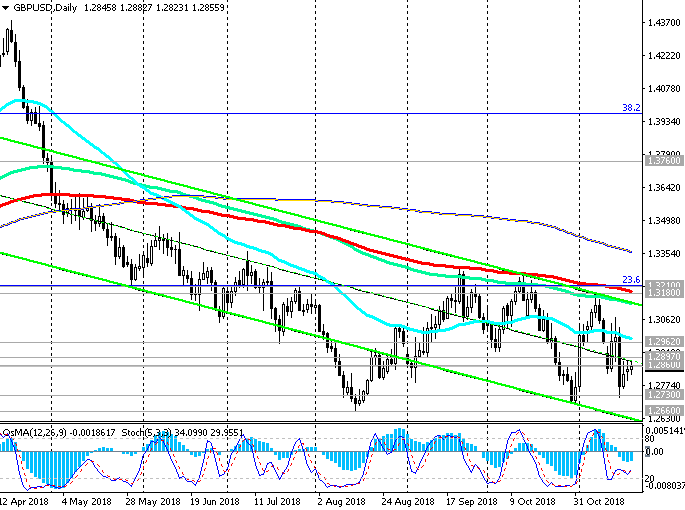 USD / CAD maintains a positive trend, trading above the key support level of 1.2970 (ЕМА200 on the daily chart). 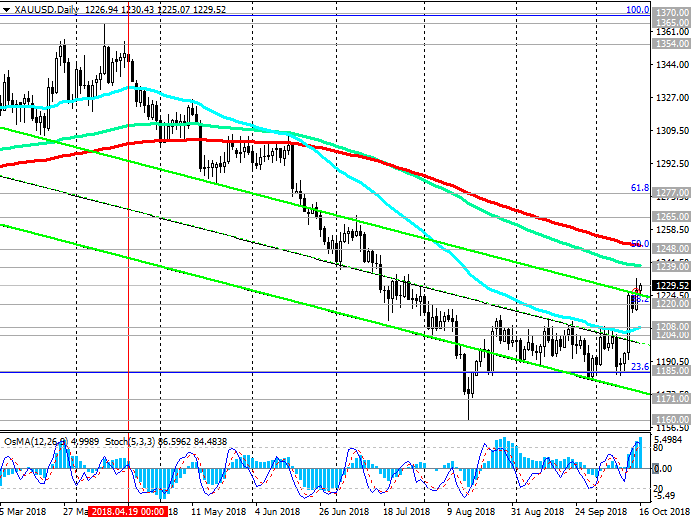 The closest targets in case of continued growth will be the resistance levels of 1.3175 (August highs and the upper limit of the rising channel on the daily chart), 1.3225 (September highs). 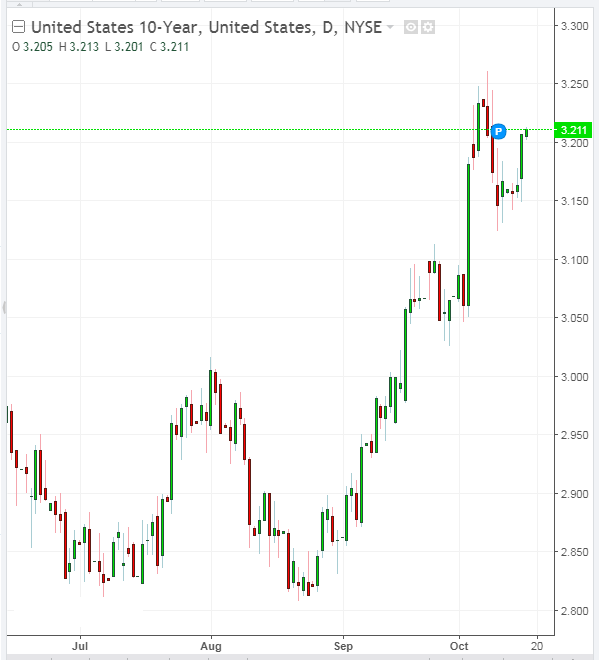 The signal for the resumption of long positions will be the growth of USD / CAD in the zone above the short-term resistance level of 1.3105 (ЕМА200 on the 1-hour chart). Above the support level of 1.2970 long positions are preferred. 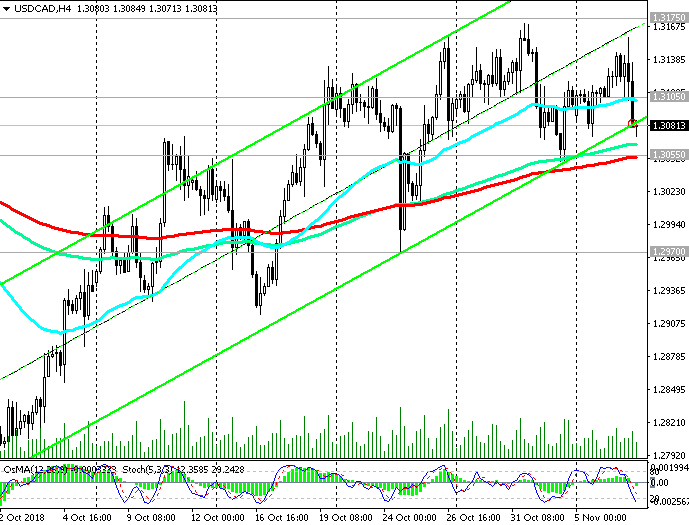 Above the support level of 1.3055 (EMA200 on the 4-hour chart) purchases look safe. Only a breakdown of support levels of 1.2740 (Fibonacci level 38.2% of the downward correction to the growth of the pair in the global uptrend since September 2012 and 0.9700), 1.2670 (ЕМА200 on the weekly chart) will cancel the bull trend. 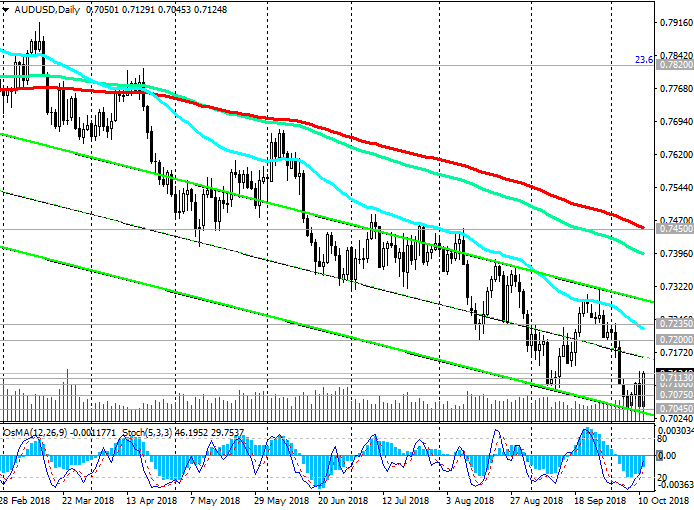 Against the background of the weakening of the US dollar since the beginning of October, the NZD / USD pair is in an upward correction after a strong fall from mid-April and the level of 0.7380. 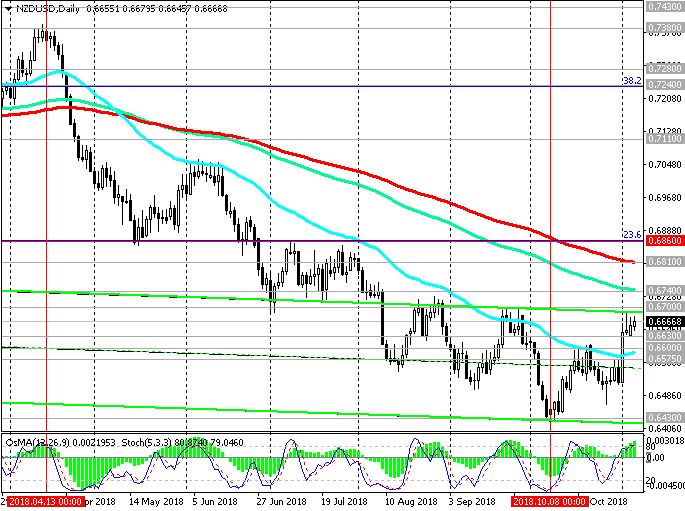 Having pushed off from the support level of 0.6430, the NZD / USD pair was able to grow by almost 400 points. 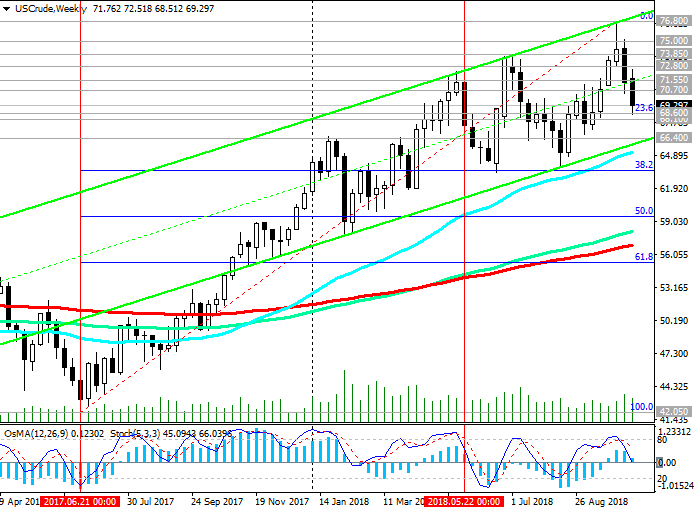 The upward correction was stopped last Wednesday at a key resistance level of 0.6810 (ЕМА200 on the daily chart). Following the two-day meeting, the Fed decided to keep the current interest rate at 2.25%. The decision of the Fed was published on Thursday (19:00 GMT). In a statement, Fed officials confirmed their plans to further increase the interest rate. Market participants expect a rate hike at the December Fed meeting (12/19/2018). The US dollar strengthened after the publication of the Fed statement. On Friday, the dollar continued to grow, while the NZD / USD pair slightly decreased, finding support at 0.6740 (ЕМА144 on the daily chart). Breakdown of this support level may provoke a decline to the support level 0.6610 (ЕМА200 on 4-hour chart). 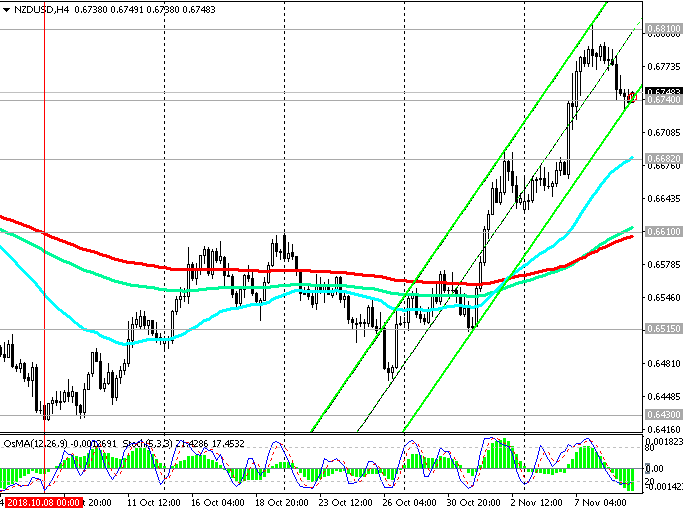 A decline below the support level of 0.6610 will mean a resumption of the bearish trend. Only a rise to the zone above the resistance level of 0.6800 (Fibonacci level 23.6% of the upward correction to the global wave of the pair's decline from the level of 0.8800, started in July 2014; the wave minima are near the level of 0.6260) will mean a break of the bearish NZD / USD trend. Below the support level of 0.6682 (ЕМА200 on the 1-hour chart) short positions again become preferable. 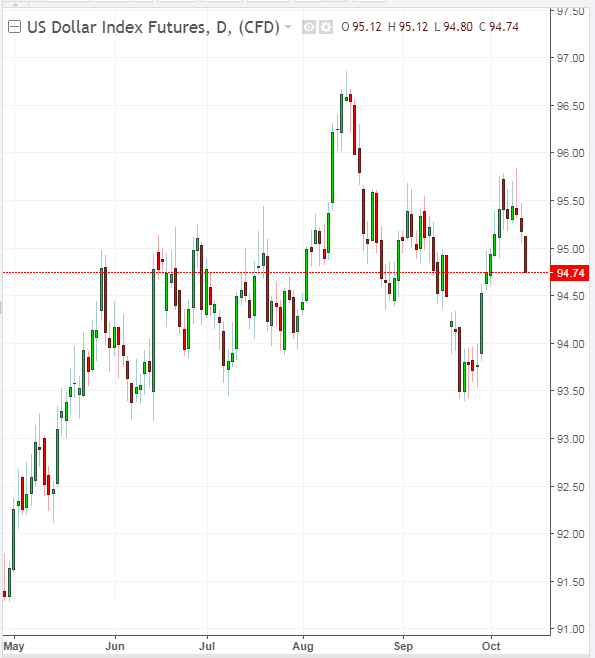 After the representatives of Saudi Arabia announced last weekend that in December the kingdom would unilaterally reduce oil exports, on Monday, oil prices rose, opening the trading day with a gap up. However, by the end of the trading day on Monday, prices dropped again, closing the trading day in negative territory. Oil prices fell after US President Donald Trump wrote in his Twitter account that he hoped that Saudi Arabia and OPEC would refuse to reduce oil production. In his opinion, oil prices should be significantly lower. WTI oil prices have lost almost 25% over the last month, demonstrating the longest period of decline since the start of futures trading on this sort of oil in 1983. Oil reserves in the United States exceed 420 million barrels. Last Wednesday, the US Department of Energy published weekly data, which indicated another increase in US oil reserves of +5.78 million barrels of oil compared to +3.22 and +6.35 two and three weeks earlier. At the same time, the number of active oil drilling rigs in the USA rose again last week to 886 units, compared to 874, 869, 861 units earlier. However, in recent months, oil reserves are close to the average 5-year values. It is unlikely that OPEC will decide to reduce production volumes. The next meeting of OPEC on this issue will be held in December. 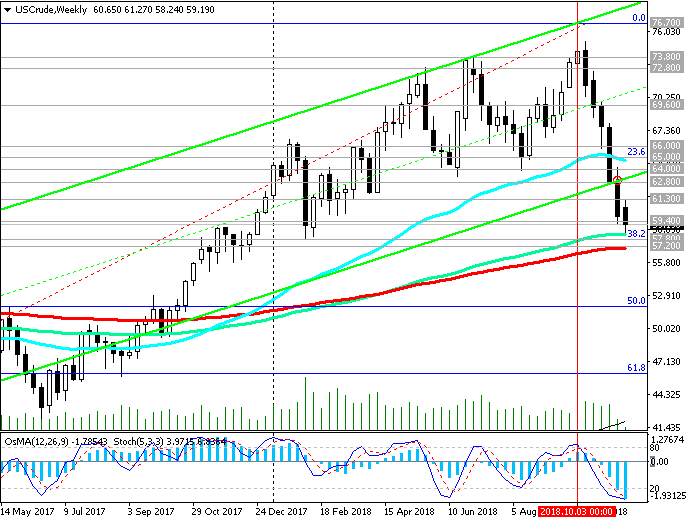 A further drop in oil prices is likely, both against the background of a stronger dollar and rising US oil reserves. The volatility of global stock markets, which turned out to be in negative territory below key resistance levels, also creates prerequisites for a further decline in demand for oil. On Thursday (15:30 GMT), the weekly report of the Energy Information Administration of the US Department of Energy on oil and petroleum products in the country’s storage facilities will be published. The previous value of +5.78 million barrels of oil and petroleum products. If the reserves of oil and oil products in the United States rose again last week, then this will negatively affect oil prices. Below the key resistance level of 66.00 (EMA200 on the daily chart) negative dynamics prevail. The breakdown of support levels of 57.80 (Fibonacci level 38.2% of the correction to the growth wave that began in February 2016 from the support level near the 27.30 mark), 57.20 (ЕМА200 on the weekly chart) can return the prices for WTI oil to the global bearish trend. The British pound stabilized on Friday after a sharp decline on Thursday on Brexit-related concerns. On Thursday, it became known about the resignation of the British Minister for Brexit Dominic Raab. Six members of the government also resigned. The pound fell on Thursday even despite the plan submitted by the British Prime Minister Theresa May on the exit from the European Union, approved by the British parliament on Wednesday. "This decision will be under scrutiny, but this decision is based on the best interests of the UK", said May. At a press conference on Thursday evening, May defended her version of an agreement with the EU. “This is such a Brexit that meets the priorities of the British people”, she said. If you do not move forward, it will mean “choosing a path leading to deep and dangerous uncertainty”, in her opinion. The pound also remained under pressure on Thursday after official data released, according to which retail sales in the UK fell by 0.5% in October compared with September, with an expected growth of 0.2%. European Commission President Tusk said on Thursday that the EU wants a political declaration on a future agreement with the UK to be submitted by November 20, and a meeting of EU leaders on this issue will be convened on November 25. Probably, the pound will remain under pressure as long as uncertainty remains regarding Brexit. At the same time, the US dollar maintains its position, despite a slight decrease in the dollar index DXY. 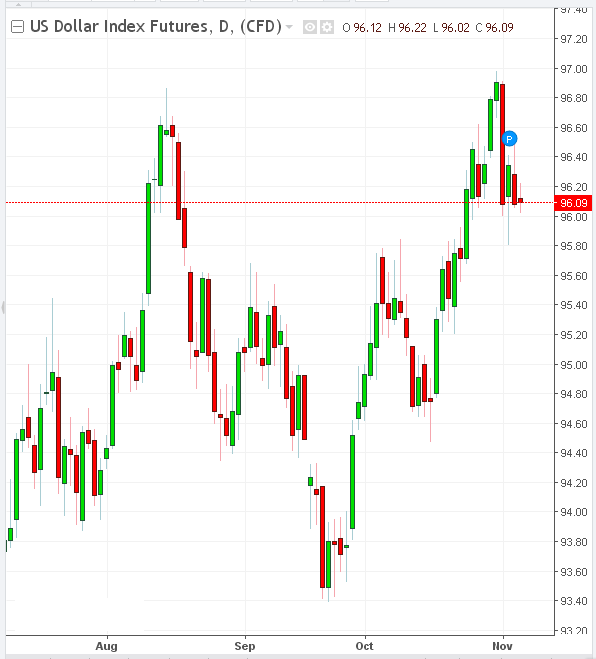 On Friday, at the beginning of the US trading session, the DXY dollar index, which tracks the US currency against a basket of 6 other major currencies, is trading near 96.85, after DXY reached a 16-month high at the beginning of the week, exceeding 97.50. Fed Chairman Jerome Powell on Thursday reiterated that the US economy is in "good shape". It is widely expected that the Fed will raise the key interest rate in December, and then raise the interest rate several times in 2019. This is a strong fundamental factor in favor of further strengthening the dollar. 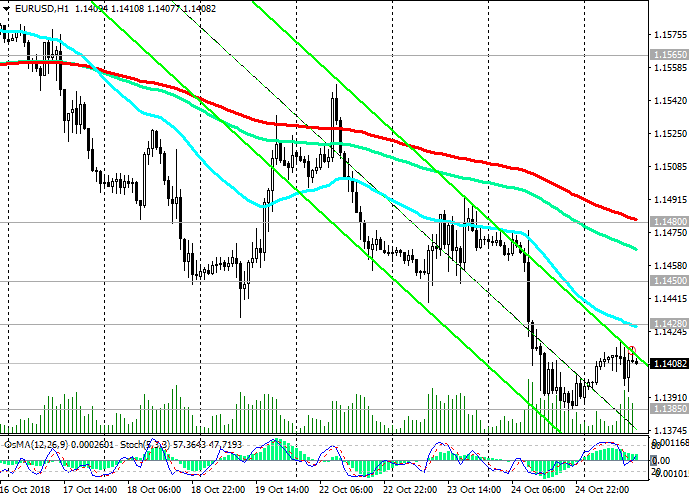 After GBP / USD dropped sharply on Thursday, the pound rose on Friday and GBP / USD recovered. Nevertheless, despite the recovery of the pound, short positions are preferable until clarifying the situation around Brexit. A meeting of EU leaders on this issue will be convened on November 25. 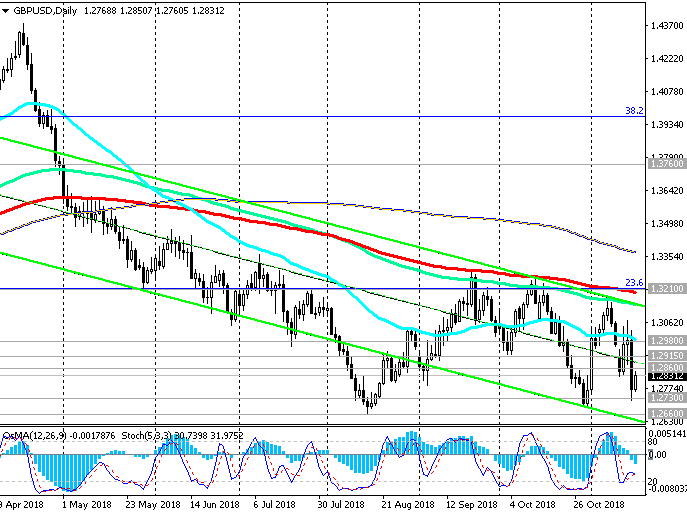 The signal for opening long positions and the beginning of an upward correction will be the return of GBP / USD to the zone above the short-term resistance level of 1.2980 (ЕМА200 on the 4-hour chart, ЕМА50 on the daily chart). According to the manager of the Bank of England Mark Carney, Brexit and the exit of the UK from the EU without an agreement - “this is a real economic shock, so central banks will play secondary roles”. In this situation, raising or lowering interest rates by the Bank of England is not so important for the economy. Mark Carney said on Tuesday in Parliament, the Bank of England’s management does not doubt the ability of UK banks to withstand if Brexit negotiations end in nothing. The probability of a Britain exit from the EU without an agreement has grown to about 50%. Last week, British Prime Minister Theresa May proposed her plan to conclude an agreement with the EU on Brexit. According to the representative of the Bank of England, Michael Sanders, British companies are not ready for the fact that the country's exit from the EU will take place without an agreement on further trade relations. Uncertainty is growing, and it is not yet clear whether the country's prime minister Theresa May can convince parliament to support the agreement reached with the EU. All of these are negative factors for the pound. 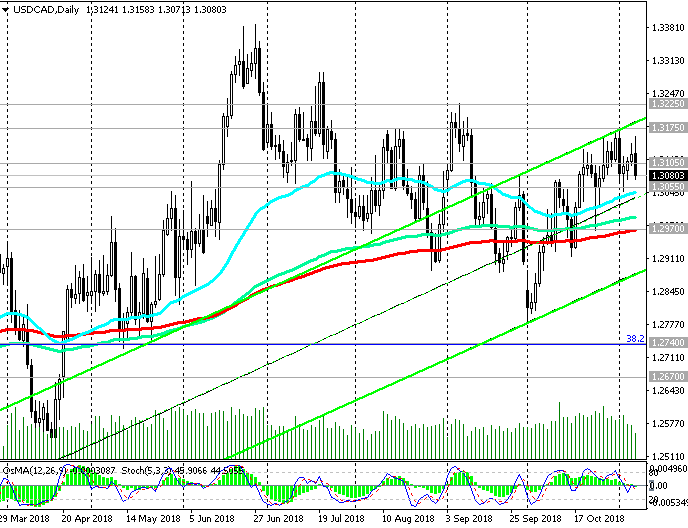 A pair of GBP / USD is prone to decline amid problems with the promotion of the Brexit project in the British Parliament and rumors about the possible resignation of Theresa May. GBP / USD continues to trade in a long-term downtrend. Despite the current correctional growth, short positions are preferable. The situation around Brexit remains the main negative factor for the pound. A breakdown of the short-term resistance level of 1.2897 (ЕМА200 on the 1-hour chart) may trigger a further corrective rise to the resistance level of 1.2962 (ЕМА200 on the 4-hour chart, ЕМА50 on the daily chart). Further growth is unlikely until an agreement is reached on Brexit. Below the key resistance levels of 1.3210 (Fibonacci level 23.6% of the correction to the decline of the GBP / USD pair in the wave that started in July 2014 near the level of 1.7200), 1.3180 (ЕМА200 on the daily chart) negative dynamics prevail.